Last year, inspired by Shelly's (Cookies and Cups) darling Santa Hat Party Mix, I made a Snowman Hat Snack in January. Since I'm ahead of the game (barely) this year, I knew a Chrismas-themed snack would be in the cards. How about some Elf Hat Peppermint Popcorn? :) The peppermint popcorn idea was a sure thing after I saw Bridget's (Bake at 350) fabulous Peppermint Popcorn Crunch...YUM! I did make a couple of modifications determined by the ingredients I had on hand, but I was happy with the results. Place a piece of wax paper on a work surface before you get started. 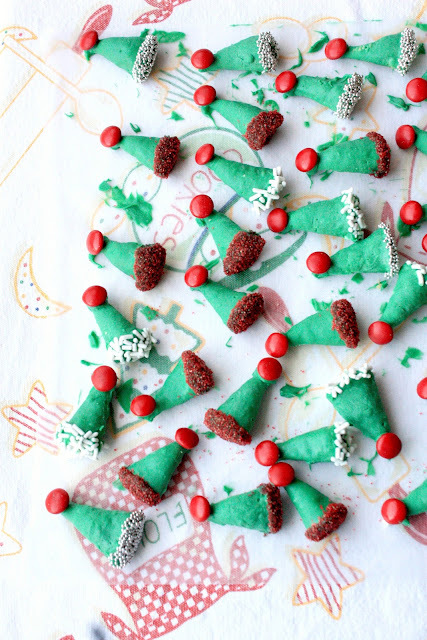 Open the bugles and set aside the amount you will need for your elf hats (I made about 3 dozen) on the wax paper. Place some red m&m's in a bowl. Melt the candy melts as the package directs. Use a fork and dip each bugle in the green melted chocolate one at a time, until completely covered. Place a red candy at the tip of the bugle while the green chocolate is still wet. Place on wax paper to dry. Do this for each hat. Once they are all dry, re-melt the green chocolate, dip the bottom rim of each little hat in it and then dip it directly in the sprinkles, or whatever you are using to decorate the rims. Set on wax paper to dry. Pour oil into 4 quart sauce pan to cover bottom of pan. Dump in all of the unpopped popcorn and cover with pan lid. When the popcorn starts to pop, shake the pan over the heat until the popping stops. Add salt to taste. Divide the popcorn between two aluminum-lined, rimmed baking sheets. Unwrap all of the candy cane kisses (while watching your favorite Christmas movie), and melt them in a microwave-safe bowl in the microwave. Start melting for 1-minute and then 30-second increments until all the candy is melted and smooth. Pour evenly over all of the popcorn and mix. At this point, also add the m&m's candies so that they will stick to the popcorn (I forgot to add them at this point, so they were loose in the mix). Let dry. Add the elf hats to the popcorn and gently toss. This recipe made a BIG popcorn bowl of Elf Peppermint Popcorn! I snacked on plenty, and packaged a bag for each munchkin, near and far. It was very tasty~sweet and salty yumminess! Such a cute idea for the holidays! So lovely! You are a genius. so cute sue! happy holidays to you! My family would adore this. In fact it would probably FLY out of the bowl and into their tummies. Super cute! Happy Holidays Sue, thank you for taking the time and always visiting my blog. I am looking forward to keep reading yours. Love these... very cute idea! so creative, and not to mention adorable. Adorable! The patience you have to dip and decorate all those little bugles! Your little munchkins and your big ones are going to love this treat. so festive and adorable!! Love your blog! Ooh, I just picked up a bag of the green candy melts! What a great popcorn treat. Hope I can make some before Christmas! I just love the color and the green hats are cute too. AWE!!!!!!!!!!!!!!! I have a soft spot for elves!!! ADORABLE sue! This is so cute Sue and I bet it tasted really good too. This is for sure on my to-make list. Merry Christmas. I hope you have some family coming to visit. What sweet little hats!!! So cute. This is the ultimate Christmas popcorn, Sue! The little elf hats are just adorable, and to get a few in a handful of popcorn is sweet, salty, minty heaven. I always mix peanut chews or M&M's in my popcorn at the movies, so I'd be all over a huge bowl of this popcorn! I know I say it all the time, but you're so creative and gifted :) Wishing you and your family a very Merry Christmas! OH, LOVE those gingerbread sandwich men below, too! So awesome! I feel embarrassed kept repeating that all your baking and cooking are cute...but they are really really cute! Merry Christmas to you, Sue and your extended family. It has been a great year for me being your blog follower. Happy 2012! Best wishes, Zoe. So flippin' adorable! And so good. Love me some peppermint! Thanks for sharing on Crazy Sweet Tuesday and have a wonderful holiday! I am a huge popcorn lover so I NEED to try this! I don't think I've ever seen this combo of flavors before so I can't wait to try it. Thank you and Merry Christmas Sue! Sue!! How stinkin adorable are these??? You are just so creative! I love your lovely recipes! Im already your follower!